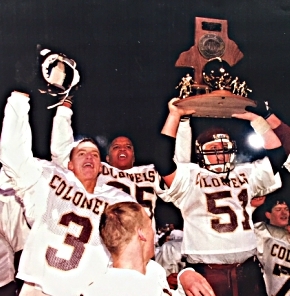 Josh Lovell (51) hoisted the championship trophy after Bourbon County’s victory over Owensboro Catholic in the 1997 Class 2A title game. Vince Grupposo (3) and Dereck Oldham (with raised helmet in background) celebrated with their teammates. When Bourbon County captured the Class 2A title in 1997, it was regarded as one of the most improbable football championships in state history. The Colonels hadn’t had a winning record in a decade, and had NEVER won a playoff game before Dudley Hilton took over as their coach in mid-summer 20 years ago. Bourbon County posted a 7-3 record in the regular season before embarking on a remarkable run through the post-season. After slipping by Somerset 15-12 in the first round of the playoffs, the Colonels registered consecutive shutouts against Boyle County (24-0), Lexington Catholic (20-0) and Lawrence County (14-0). They capped things off by beating Owensboro Catholic 39-28 in the finals on a bitter-cold night at Louisville’s Cardinal Stadium. Two decades later, I was curious to hear some of the key players on that Bourbon County team reminisce about their championship season. They were teenagers then. They’re in their mid to late 30s now, and scattered across the country. — Nick Kendall, who was a speedy running back for the Colonels, lives in Hawaii with his wife and two sons. — Dusty Lotz, an undersized but fierce nose guard, has lived in Florida since graduating from the University of Florida with a degree in mechanical engineering. He and his wife have a son and daughter. — Carter Conley, who quarterbacked the title team, is an assistant football coach at Centre College, his alma mater. He and his wife live in Lexington with their two daughters and son. — Tim Perysian, who starred at tailback and linebacker, did two tours in Iraq as a Navy helicopter mechanic after 9/11. He lives in Michigan and has four daughters. — Jeremy Wigglesworth, who returned a blocked field goal 85 yards for the clinching touchdown in the state finals, is a manager at the Paris Stockyards. He has a six-month old son named Angus. While the Bourbon County players understood why the fans and media thought of them as Cinderella in cleats, they themselves weren’t surprised they won the state title. They all but predicted it. Lotz still has his Bourbon County yearbook from the 1996-97 school year, when he was a junior. 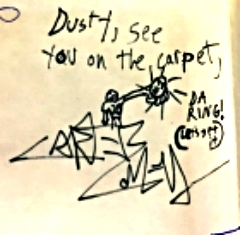 Conley and Josh Lovell (who played center) signed the yearbook before their senior football season (’97) got going. 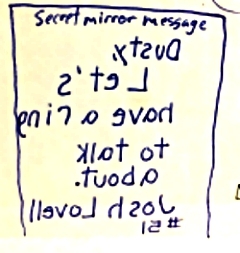 Lovell had a “secret mirror message” that he wrote backward (shown below): “Dusty, Let’s have a ring to talk about.” He meant a state championship ring. The players knew they had the makings of a really good team. They had won big in middle school, and were undefeated as freshmen and sophomore jayvees. Tim Persyian was a two-way star for the Colonels. On offense, he led the team in rushing and scoring, and on defense led the team in tackles. Especially with the addition of the Perysian brothers, Tim and Tom, who had moved to Kentucky from Michigan the year before. And Tim Perysian was a pretty awesome player. Lotz described him as “an X-factor” on both sides of the ball. As a junior on the ’97 title team, he led the offense in rushing (with more than 2,400 yards) and scoring (30 touchdowns), and he also led the defense in tackles. Kendall recognized the team’s overall talent level, too. “People felt we were kind of a Cinderella team and they thought some luck happened to get us there,” he said. “But it really was the talent and the (preparation). Dudley Hilton had proven he knew how to win by building top-level programs at Breathitt County and Bell County. He arrived at Bourbon County driving a Bell County-blue Ford F-150 pickup that he got after guiding the Bobcats to the 1991 state championship. Bourbon County Coach Dudley Hilton talked to his team before the finals. Conley thought Bourbon County was the perfect fit for Hilton. Not that Hilton took it easy on them. Hilton, of course, was the highest ranking Colonel, but he wasn’t the team’s only leader. Conley, Lovell and Lotz were also responsible for pointing the way to success. Conley and Lovell each earned Eagle Scout status that fall, and Lotz was one step away from reaching it. Having eight seniors, most of whom played both ways, was a big plus, too. But Lotz also credited some of the unsung heroes, like sophomore linemen J.T. Barnes, who didn’t let a broken finger keep him from playing, and Luke Fister, and junior defensive end Kyle St. John. Bourbon County’s 1997 title team included 8 seniors. 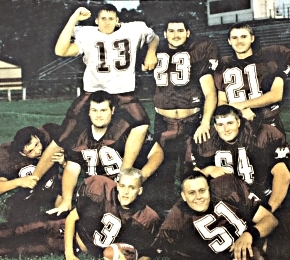 Clockwise, starting top left, Carter Conley (13), Jason Greenlee (23), Nick Kendall (21), Heath Buckler (64), Josh Lovell (51), Vince Grupposo (3), Dusty Lotz (pretending to bite Conley’s leg), and Cecil Buckler (79). Bourbon County — the community, not just the school — celebrated the Colonels’ state championship every way possible. While the players basked in the glory, most of them didn’t realize just how big a deal it was. Lotz remembers a lot about that championship season, and while he doesn’t dwell on the past, he said he cherishes the memories. “I’ve used that to remind myself that at one point I was a champion, and I remember what it took to get to that point. It didn’t come easy. It didn’t happen overnight. Most of the players still have their 1997 championship rings. Some display them in their homes. Some have them locked away in safes. Tim Perysian’s ring went missing and he’s never been able to find it. But he still has the most important thing he earned that football season 20 years ago.